Plot: An old gunman rejects retirement for one last job as he enlists the help of his old partner, and someone new, who is much younger than him. An old gunman rejects retirement for one last job as he enlists the help of his old partner, and someone new, who is much younger than him. This movie was not for me, I love the good, the bad and the ugly but this western was not for me. It ain't bad, but it ain't special either. I simply do not understand why people love this movie. The movie was okay. It had many flaws, unlikable characters and boring scene after boring scene. I understand what Clint Eastwood was trying to do. He chose a different route and made a less-than-action-packed Western. I can't relate to the characters at all. We're supposed to sympathize with William Munney (especially in the last few scenes), but I can't bring myself to like him and want him to succeed, especially when he has such a cruel and unforgivable (haha, Unforgiv-able) past and character. English Bob is an extremely useless character. He's only there so that Gene Hackman can shout a few insults at him, which lend no perspective or bring the story further. Sheriff Little Bill Daggett (Gene Hackman) manages the situation of Skinny and the prostitutes. A group of whores offers a reward to whoever can kill Quick Mike (David Mucci) and Davey (Rob Campbell) who scarred Delilah. A cocky Schofield Kid (Jaimz Woolvett) introduces himself and asks William "Will" Munny (Clint Eastwood) to be his partner for the reward of $1,000 into Wyoming. Will visits Ned (Morgan Freeman) and recruits him to catch-up with the Kid. The three enters the town of Big Whiskey, where English Bob (Richard Harris) and Will gets beaten up by Little Bill. Ned gets captured and eventually dies. The Kid goes back to Kansas to distribute the reward money to Munny and Logan's families. Will goes back to avenge his loyal partner. No posts have been made on this movie yet. 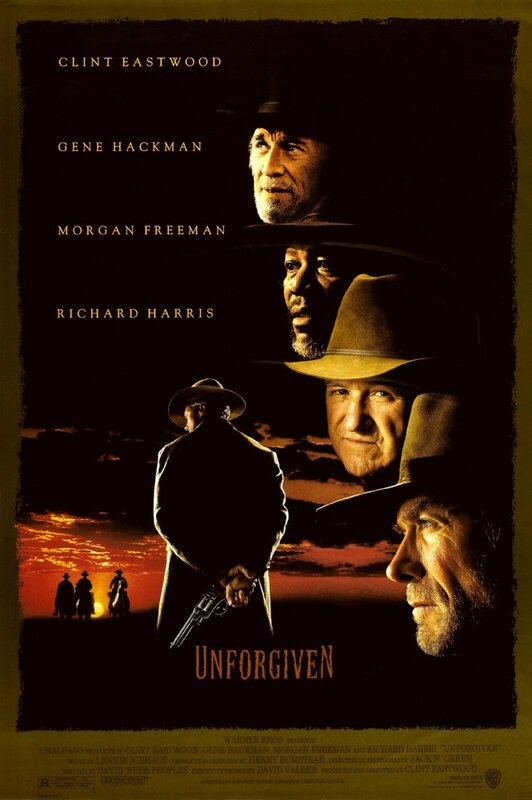 Be the first to start talking about Unforgiven!